Ok, I had a bit of fun in my last post but the (hopefully) obvious point I was making was really anything but fun. The bloodletting analogy works very well and not only because that ancient practice lengthened the patient’s recovery but also because of the reason that it gained such popularity. And what was that reason? Well most of the time, patients undergoing a course of bloodletting got better. It had nothing to do with the bloodletting of course, it was due to the fact that when people are sick they usually get better. It’s easy to laugh at how dumb our previous generations were but when I look around today, I’m not sure we have learned any more than our ancestors about the difference between causation and correlation. You could summarise it by saying that the financial crisis gave a very strenuous test to the basic model of macroeconomics and that model came through with flying colours. That model, when applied to the circumstances in which our government came to power, (an economy suffering from a lack of demand, with interest rates at zero), said that cutting government spending would just make things worse. Output in the short term would be determined by demand and cutting government spending would further reduce demand. Cutting spending at such a time would cause the economy to remain unnecessarily weak for an unnecessarily long period. Lo and behold that was what happened. The government had predicted, with their austerity measures in place, the UK would see significant growth in 2010, 2011 and 2012 but all we got, as the basic model predicted, was depression. I think on that part of the argument we’re pretty clear – the basic model predicted bad things, the government predicted good things and we got bad things. There is though, apparently, some confusion regarding the fact that we are seeing the economy starting to recover, (and I do believe it is a recovery). The government is now saying this recovery advocates their policy of austerity in a depressed economy. That seems reasonable enough, doesn’t it? Er, no. In making this argument, the government is intentionally misrepresenting the basic model and what it’s supporters said. The basic model told us that output would be driven by demand in the short-run and supply in the long-run. In other words, assuming that the downturn didn’t cause the UK to lose its ability to make things, the economy would eventually adapt and growth would one day begin again. The argument was never that growth would never return with government policy, it was simply, that when we have all of the knowledge and all of the tools to implement a recovery in the short-run, why should we wait for the long-run? The British economist John Maynard Keynes faced the same arguments in the 1930s when he proposed government spending to solve The Great Depression. He acknowledged that, irrespective of government policy, the economy would recover in the long-run but as he famously pointed out, in the long-run we’re all dead. If you have the knowledge and the tools to solve a depression now, you should probably do it. The alternative of waiting for the long-run would be pretty dumb. Saying that a recovery now is advocation of their policy is entirely ridiculous though and there is a real danger, as the recovery continues, that people will accept that austerity in a demand-led recession causes a recovery and the same mistakes will be made next time. 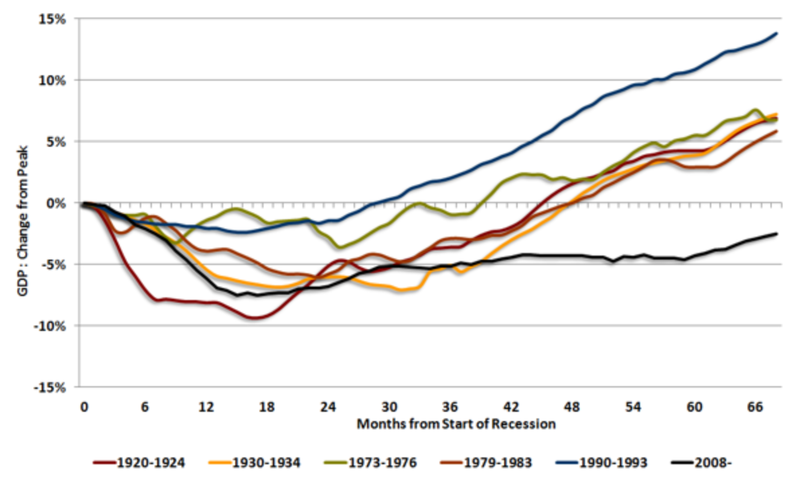 Of course, the reality is that the government’s policy was never about engineering a recovery. The reality is that they used the recession as camouflage for the policy they wanted to implement anyway – shrinking the public sector and reducing taxes for the rich. I often refer to the bad policies as “mistakes” but that is giving the government far too much credit because all along, they knew exactly what they were doing and why they were doing it. Economics is far from perfect but it will have proved an extremely useful discipline if only we learn the lessons of the past six years. If an eventual and inevitable recovery in the long-run is taken to be a justification of what our politicians did then we might as well throw economics in the bin and just let our future selves be governed on nothing more than the political ideals of the right. Britain, 1642. A patient, Mister Edmund Conomy of London, sits up in bed, sipping broth from a bowl. People stand around his bed amazed at his miraculous recovery. Four long years earlier, Edmund had been struck down with a severe case of anaemia. The new local physician, Doctor Gideon had fortunately arrived early on and prescribed a course of bloodletting to treat his condition. Doctor Gideon had pumped out a few glugs on his first visit, then returned each month and never noting a change in his patient’s condition, continued, each time, to pump out a few glugs more. Miss Sents’s protests were ignored and over the next three years, Dr. Gideon continued his policy of letting blood from Mr E. Conomy. Mr. E. Conomy didn’t recover though. In fact he looked worse than ever. By the fourth year, Dr. Gideon, noticing the pale and shrivelled look of his patient, decided to drastically reduce the amount of blood he was letting at each visit but he didn’t want to tell anyone he was doing that. He did just a tiny bit each time to show he was sticking to his “tough policy” because he was afraid of what people would say if he changed course. Then the miracle happened. Mr. E. Conomy started to recover and once he started to recover, the recovery was quick. With every month that passed, his strength grew and within a year he was almost as strong as he was when the illness struck. Dr. Gideon was made a hero. Stories of the success of his bloodletting on Mr. E. Conomy spread far and wide. Perhaps it would not be unfair to say that Dr. Gideon was a major factor in spreading them. And what became of Miss Carmen Sents? When Mr. E. Conomy learned exactly what had cured him, and of the erstwhile protests of Miss Carmen Sents, he fired her and sent her out of his house to live on the streets. After all, the success of his treatment was obvious and where would he have been if people had listened to her? Sadly, in all of the bravado, no one seemed to notice that in every previously recorded case of anaemia, the patient had, without bloodletting, recovered much faster than had Mr. E. Conomy. Sadder still, they now thought that bloodletting was the best way to solve anaemia.